London, Sotheby's, 5 July 2016, lot 17; purchased from a dealer shortly thereafter. Ms. single leaf with miniature portraying the Annunciation to the Virgin as an allegorical unicorn hunt. A rare example of Nonnenarbeit (nuns' work: paintings or drawings made by nuns), this charming miniature lays out a complex iconographic program that fuses the biblical narrative of the Annunciation with the allegorical story of the unicron hunt. 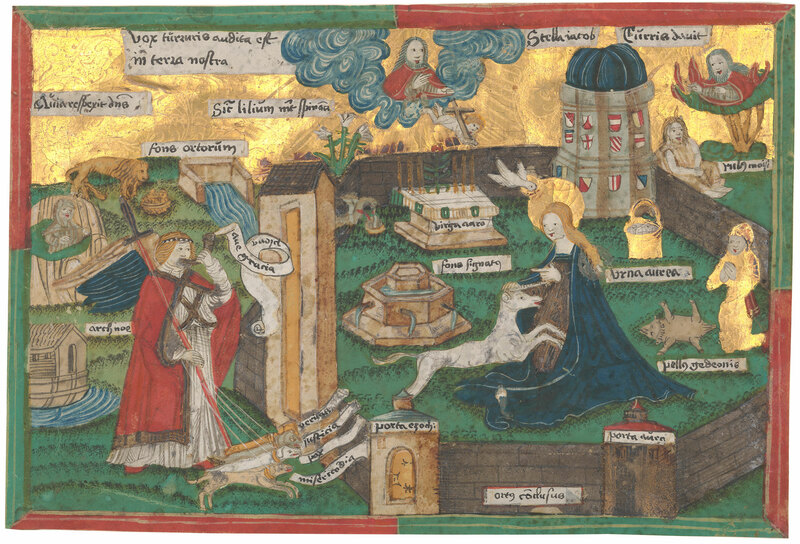 The Virgin Mary is seated in an enclosed garden (Hortus conclusus), while the Archangel Gabriel is outside its gates, sounding a horn and leading four hounds on the hunt for the mythic unicorn, which rests on the Virgin's lap. In line with the intended didactic function of this small devotional image, each of its iconographic details is clearly labeled, thus helping the viewer piece together the complex visual program. This combination of innovative iconography with clear didactic labeling is characteristic of devotional art produced by and for cloistered women in late-medieval Germany.